A new spiritual shop in London, Head & Hands. Spiritual shops in London are few and far between with many of them a little outdated and uninviting. However, a new generation of spiritual shops has started to bloom, along with a new generation of people dipping their toe into this almost forgotten scene. We had a catch up with Amanda, the proud owner of Head & Hands. A beautiful online and in-store mystical shop, selling everything from holistic crystals to stunning, handcrafted jewellery. Amanda also hosts beautiful crafts and mindfulness workshops in her shop & various pop-up locations, as well. We spoke to her to find out what her influences are, how she started her business and how she sees it carrying on into the future! Amanda, tell us a little more about Head and Hands, and the ethos that sits behind its beautiful front! Head & hands is a carefully curated store supporting small independent makers. 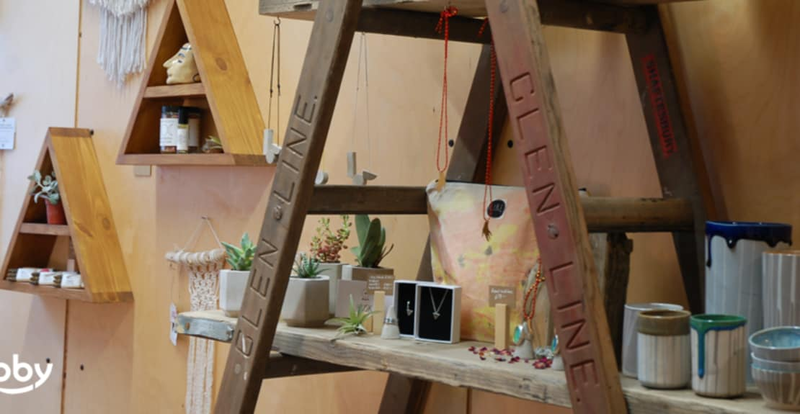 Stocking a range of handmade goods and gifts, from ceramics to jewellery, homeware to apothecary, everything is made by loving hands and with good intentions. The products in the collection promote healing and self-care. In addition, I also run a number of conscious craft workshops to help busy the hands and quiet the mind through artistic practice. these take place around East London, in like-minded spaces. Head & hands hosts a number of different artists and teachers, making space for them to share skills and wisdom. Have you always had spiritual influences? I think the word spiritual can be a little off-putting for some people, but I suppose I always had quite mystical influences around - with a father that reads palms, and an uncle that practiced Reiki healing. When I was around twelve, my dad bought me my first tarot deck and introduced me to our local crystal shop. So I always had a curiosity for the esoteric. But it wasn’t until years later that I re-connected with that part of myself again. Why did you decide to start head & hands, was it a natural process? The seeds were planted, although I didn’t realise it - about 6 years ago when started during my own quite personal journey, battling with a chronic illness. During one particularly bad flare up, I was signed off of work. At the time, I was struggling quite significantly with insomnia due to strong medication I was taking. The medication notoriously makes you feel super wired and I was so jittery and anxious that I couldn’t seem to sit still let alone rest. The only thing that steadied me and calmed my mind was teaching myself to weave and embroider. From that point on, I became really interested in the healing remedy of crafting something in your hands. Years later, an opportunity came about in my local area to apply an ‘incubator space’ a small shop unit which allowed a fledgeling business to test out ideas and grow. I pitched my idea, for a workshop space which also sold beautiful handcrafted gifts. They offered me the pop-up space for six months, and that’s when it all started. How do you determine the events you schedule, where do your ideas come from? My ideas come from activities I'm interested in myself and through the connections, I have with other artists and makers. I love making things happen and collaborating with creative people so it often comes about quite naturally through conversations. What has been the most successful tool for you in terms of starting your own business? I’d have to say Instagram! It’s an amazing way to connect with artists, suppliers and customers - a visual way of communicating what Head & Hands is all about. What has been the biggest hurdle in starting your own business? At times it can be quite challenging having only yourself to bounce ideas around with. So I do have to check in with other people to ensure I am making good decisions. And then sometimes you’re in danger of talking too much about your business. So staying balanced can sometimes be tricky and it’s something I’m mindful of - I’ve realised it’s really important to meet other small business owners and take on a mentor as I have done recently. What has the best thing you have done with Head and Hands been? It’s hard to choose! I've loved every single workshop. Each one is memorable and it seems to attract the loveliest people. I always leave a workshop buzzing because everyone is always so delighted afterwards with what they’ve learnt to make. I ran a lovely mindful mandala workshop at London Design Festival, in a purpose built pavilion. It was an amazing space to teach in, and it was great to be part of a brilliant programme. But I also adored the 6 months I had in my first shop. Everything about the shop came together so perfectly and in such a short timeframe. Sadiq Khan came to visit and I was really proud to show him around. Having that space is what helped build a solid community around Head & Hands and I’ve met so many wonderful people, some have become really close friends. Where do you see yourself in 10 years, what is the pipe dream for head & hands? The dream is to have a Head & Hands bricks and mortar shop, therapy room and workshop space. Maybe even a little healing garden out back growing plants and herbs which can be used for our botanical workshops. There would be a programme of creative and mindful workshops, yoga classes, supper clubs and artist talks. It would be a healing sanctuary for slow, grounding activities and a beautiful space to browse the store. What is your life like behind the scenes? What’s an average day in the life of Amanda? There isn’t really an average day, every day is different and that’s just how I like it! At the moment - I head over to the shop, which is currently in residence at a nearby yoga studio. En route I’ll usually need to post some items which have sold online. Once I’ve arrived in my workspace - I might need to do a blog post, Instagram post or catch up some emails about the latest workshop that I’m planning. Sometimes I join in with the yoga class. There’s always lots of admin to do, paying invoices, ordering stock, booking venues for workshops. But once I have cleared that off my list, I like to make time for fresh ideas. Thinking about new gift boxes, workshop collaborations, or products. In the evening I will cook dinner, and afterward will pack any orders which have come in that day from the store. Then every night I take a long candlelit bath. I light some sage or palo santo, put on some music and try to clear my mind. How do you decide what to stock in your shop? I have a few criteria for what makes the edit for my store. Most importantly, it must be handmade. There needs to be a sense of the maker behind each item, feeling their energy and intentions in the work is most important to me. Whether that’s a ring that is engraved by its maker, a wash-bag hand dyed and sewn, a ceramic planter with a gorgeous unique glaze, some herbal apothecary oil with a hand-illustrated label, or slippers each pair stitched in different threads. For me, it’s celebrating that process. I truly believe that when something is handmade, it carries a loving vibration of its maker. There’s a magic that is transferred between their head and hands. I also favour products which help promote self-care and time to slow down and reflect. So that might be with bath salts, hand poured candles, a tarot deck, incense, eye pillows and even tarot cards. The Head & Hands collection is all about celebrating handmade, intentional items that slow us down for self-care, rest and healing. My suppliers are all over the place. Some of my suppliers are very local in East London, others are in the States, one brand works with indigenous peoples of South America and I also carry some amazing slippers hand woven in the Himalayas. When I come across an item that excites me, I get in touch with the maker and see if they like the energy of my store and what to be part of the collection. What makes your workshops different from others? My workshops explore the intersection between creativity and mindfulness. Between self-care and slow immersive crafts. The Hungarian psychologist Mihaly Csikszentmihalyi has written extensively about the theory of Flow and this concept is really central to all of my workshops. So my workshops all favour the types of activity which allow the participant to become totally absorbed, and therefore focused on the present moment rather than past concerns or future worries, with grounded state of enjoyment and inner peace. Past workshops have included; natural dye and slow stitch, cross stitch, beginners weaving, macrame, yoga and mindful flower arranging, mindful mandalas, botanical watercolors, paper crafts and crystal talismans. You can book all Amanda's classes through Obby. We curate all our teachers and workshops, making sure we offer only the best. Its wonderful people like Amanda, who make our community so brilliant. Check out her school page on our website, and browse all her current classes!